The Ministry of Internal Affairs of the Republic of Kazakhstan along with other interested state bodies has drafted a comprehensive strategy for social rehabilitation of individuals released from prison and registered with the Probation Service, which was presented today a roundtable. The strategy was produced in accordance with the National Action Plan and the 100 concrete steps approved by the National Modernisation Commission. The event was organised by the OSCE Program Office in Astana, Kazakhstan and PRI’s Central Asia office. This comprehensive strategy aims to reduce re-offending and social exclusion and deprivation of prisoners after release from prison and while being registered with the Probation Service. This strategy has been prepared based on the analysis of the current situation, opinion of scholars, national and foreign experts, with due regard to international experience. International experience demonstrates that the effectiveness of the re-socialisation process depends on many factors, including preparing prisoners for release while in prison, as well as the social and psychological assistance provided in the period after release. The government of the Republic of Kazakhstan has already started to improve measures for social rehabilitation. Currently, there are 57 secondary schools in prisons, which enrol more than 3,500 children a year. There are 47 vocational colleges, where more than 3,500 prisoners are trained in 35 service professions as welders, carpenters, and plasterers for example. There are currently more than 170 businesses engaged in production in places of detention. It has also taken steps to reduce the prison population. Thanks to the Government’s efforts to reform and humanise criminal policy, the prison population is falling each year. In 2015, the number of prisoners held in penal institutions was 39,945 – compared in 2014 to 47,939 and in 2013, 49,821. Steps have also been taken towards expanding the Probation Service, which is an effective tool for delivering social rehabilitation. Successful rehabilitation depends on cooperation between all relevant state bodies and non-governmental organizations, and on the creation of a mechanism of supervision of individuals from the moment of their entry into the prison system to after their release from prison. According to the Strategy launched today, an individual program of preparation for release will be developed for each prisoner, aimed at correction, generating aspirations towards a law-abiding future, employment and engagement in other socially useful activities, improved education, and participation in rehabilitation projects. Experts from state, local authorities, public associations and non-governmental organisations, as well as volunteers will be involved. “Two out of four possible stages of probation are currently in operation in Kazakhstan. However, the Ministry of Internal Affairs of Kazakhstan is preparing a series of legislative changes, which will enable the introduction of the entire cycle of probation, including probation as an option at sentencing stage, and as a mechanism to ensure that a report on the circumstances of the offence and of the offender are available to the court at the pre-trial stage. 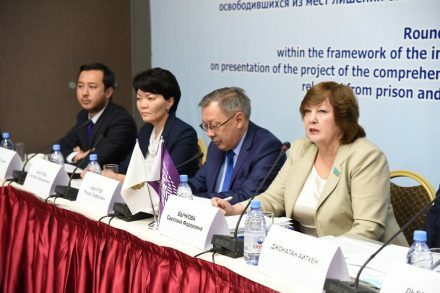 If imprisonment has already been applied, probation will help prisoners to prepare for release, ensuring they are supervised over several months,” said Azamat Shambilov, Regional Director of Penal Reform International in Central Asia. For more information, please contact PRI Project Coordinator, Zhanna Nazarova, at: znazarova@penalreform.org or + 7-7172-79-88-84.